Some municipalities require a building permit for installing (fastening) an awning to the house. Before purchase check with your local building department. High winds can cause damage to an extended awning. Some people say that if you cant read a newspaper comfortably under your retractable awning the wind is too high and you should retract it. Some newer designs retractable awnings incorporate a wind sensor for automatic retraction in certain conditions. * Standing water may stretch the awning covering. * Leaves left on the awning may cause discolouration. * To prevent mildew problems do not not store awnings when damp or wet. * Do not BBQ underneath the awning. A retractable awning (better known as patio awning) is a covering attached to the exterior wall of a house, that is stretched tightly over a light weight structure of aluminum, iron or steel. Retractable awnings are either manually or electrically operated. 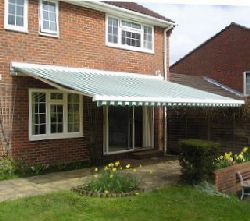 As can be expected the manually operated retractable awning is more economical to purchase as well as to operate. They come with a removable crank handle and gearbox. Retractable awnings are easy to adapt to almost any deck or patio. Some models come with support arms that can be angled back against the house or set vertically on the deck or patio floor. These arms provide extra support and stability in areas where high winds can be expected. Motorized awnings have no vertical supports. Instead, they have retracting lateral arms, creating an unobstructed shaded area. These awnings are operated by an electric motor, generally hidden inside the roller bar of the awning. The arms open and close the awning at the touch of a wireless remote control or a wall-mounted switch. Motorized awnings are the ultimate in convenience. High winds can cause damage to an extended awning, and newer designs incorporate a wind sensor for automatic retraction in certain conditions. Retractable awnings are now becoming very popular with homeowners in North America. They have been popular in Europe for many years, due to higher energy costs and lack of air conditioning. Lateral arm awnings are a modern version of the old storefront crank-up awnings of the last century. Tension arms and a roller bar are supported by a torsion bar. The torsion bar fits into wall or soffit brackets that spread the load to the width of the wall. Hand-cranked awnings are still available, but motorized awnings are now most common. Many motors now have a built-in receiver and are operated by remote control. 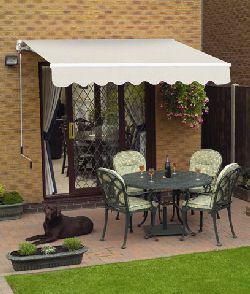 In areas with wintry weather, most awnings do not have to be taken down at the end of the summer. They can remain retracted against the building all winter long, or be designed and built for those conditions.